Crassulaceae. Zones 7b-11. 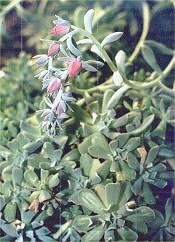 Light blue-gray rosettes of thick succulent foliage topped in autumn by 2 ft. stalks of shrimp-colored slender bells. Does well as an indoor plant in an east window or outdoors in a succulent or rock garden. Outdoors, plant on a slope for best drainage. Well-drained soil, full sun.